Think back to when you were 4, 5, 6 or 7 years old. What is one of your fondest memories? Well, I must admit, that mine are of bed time, snuggling with one of my parents and being read to. I felt so loved. It was the perfect way to end each day. When my kids were little, my husband (Andy) and I continued this tradition. We started out reading picture books with our kids and later advanced to reading children’s novels together. Some of our favorite authors are: Raold Dahl, Shel Silverstein, Louis Sachar, and of course, Dr. Seuss! Dr. Seuss, or rather Theodor Seuss Geisel, was born on March 2, 1904. 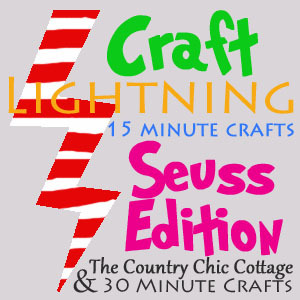 In honor of this amazing author, a group of us are sharing some “Craft Lightning” projects that you can complete in 15 minutes or less (excluding drying time). In honor of our special bedtime memories, I’m sharing the following project with you. Make sure your mug is clean. Using a sharpie marker, write “Hop on Pop” or other Dr. Seuss phrase of your choice (You can find some HERE and HERE. Bake in your heated oven for 35 minutes. This will set your ink and make it permanent. Now, like I said earlier, this is in honor of our special bedtime reading times. So, I’m planning ahead a bit (I know you’re shocked). I decided this would be a great Father’s Day gift….take a look at the back. If you make a mistake, just dampen a paper towel with fingernail polish remover and it will wipe right off! I would hand wash your mug……do not wash in a dishwasher. What Dr. Seuss quote would you write on your mug? Dr. Seuss projects will be shared all week long from various bloggers! To see more, just click on the button below!